Google is the very common name to every class of people. We all know about google. Google is very popular to all of us. Today we will discuss something about this google. Google is a Search Engine. You can get anything from google. Google has lot of data to help you on web. If you need anything on web google is the best way to find that. Every website or owner of the website upload there files or articles on google. Google get them visitors for their visitor. The owner of the website get benefit from it. What you know about google ? Do you know everything about google ? Not think so. You don’t know everything about google. Today we will show you a thing about google and that google can track you. Yes it’s true. Google can track you. It know many thing about you. It know that what you are doing on web. You don’t know about their power. They can do anything. Google is the awesome thing to all of us. We can not do many thing without it on web. You must have a Google Account to browse internet with many benefit. That’s why we all have a google account. If you want to stop google from tracking you then you are at the right place. you just need to visit the page Ads Personalization and unselect the following option…. Also use Google Account activity and information to personalize ads on these websites and apps and store that data in your Google Account. 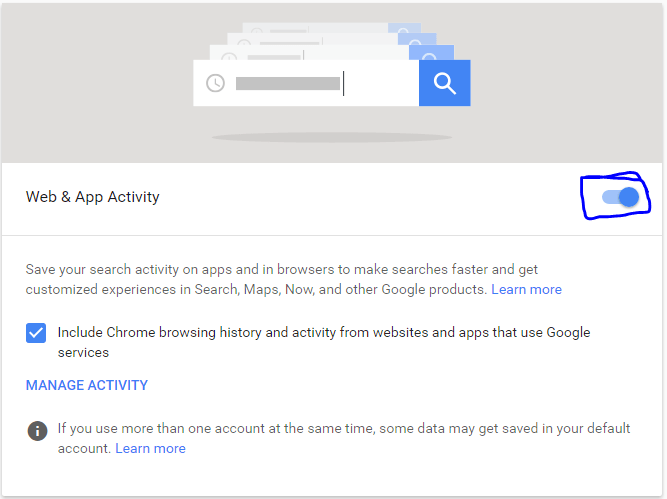 First of all Log in to your google account Google Web and App, Google Activity Page. Now click on Gear icon which will open some options. Now you need to click on Activity Controls. By doing this you can opt out from this. After doing this google can not track you. It can help you. Hope you like this trick. You can comment us bellow. Till the new trick be well.